Our most precious assets are our people. our newly admitted students, our existing students, faculty, employees, alumni, parents of students, local residents in our region and anyone else who visits our website are all part of our university community which aims to open its doors to everyone. Since its establishment in september, 1951, chungbuk national university has produced more than 150,000 graduates who are actively contributing to the development of our society in various walks of life. the central location of our university is one of its big strengths. not only is chungbuk national university campus located close to the sejong government complex, osong biovalley, innopolis daedeok, and the ochang scientific industrial complex, it is also a short distance away from osong (cheongju) station on the ktx line and the cheongju international airport, allowing easy access. 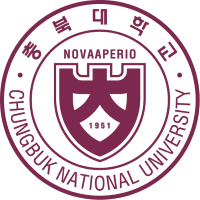 in recent years chungbuk national university has grown into a full-fledged global educational institution that promotes active exchange with other organizations abroad. Aiming to become a hall of 'truth, justice and innovation,' chungbuk national university aspires to make itself 'heart of korea, creative communiversity for dreams.' to that end, we focus on fostering 'creative talent' that can draw on multiple disciplines to meet the challenges of our times. our faculty, students, the university as a whole, and the local community are integral stakeholders that form a larger community and a 'creative learning network' that incorporates our alumni as well. we are well on our way to forming a "creative research cluster" through cooperation with and support from the national government, local government, businesses and the local community.